If you've been trying to sell your house without any luck, you've probably gone everywhere for help. Or maybe you've called in your real estate agent and begged for his or her insider tips. And perhaps you've thought of selling your house on eBay. If not, check out this eBay site. But have you consulted St. Joseph? I had no idea that this is a pretty common tradition in real estate -- and I'm Catholic myself -- until I started looking into this. But as it turns out, this is a Midwestern tradition rooted in a European custom that's centuries old. But naturally with the housing market the way it is, St. Joseph is getting particular special attention right now. Whether seriously hoping for divine intervention or just feeling that it's a fun, no-harm-done attempt to get some extra help, home sellers are bringing St. Joseph into the home market game. That would be because he is the patron saint of real estate agents. In Modesto, California, mortgage broker Philip Cates has been selling St. Joseph statues -- thousands of them -- since 1990 -- and has recently been getting a lot of interest. Even in upscale Marin County, near San Francisco, where million dollar bungalows are sold to high-tech moguls and their ilk, house-peddlers have taken up his idea in an effort to spur stalled sales. The Marin Association of Realtors, which is in the San Francisco area, has been selling St. Joseph statues since late May and getting good feedback from their customers, mostly other real estate agents. 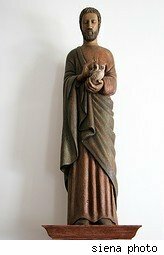 The way it's supposed to work is this: You get a St. Joseph statue, in the usual manner -- buy, borrow, beg or steal (uh, scratch that last one... probably not a good idea, considering who you want to work with). Then you bury the statue of St. Joseph upside down in the yard of your home. And sooner than you would expect, your house will be sold. And while you'd expect devout Catholics to try this, apparently it's been embraced by Catholics and non-Catholics alike. I read some statistic that suggested around 2 million of the statues are buried around the country. Maybe it sounds crazy to some people, but I think it sounds like a fun thing to try. You might as well recruit all the help you can. Besides, if God can be your co-pilot, why shouldn't St. Joseph be your real estate agent?